It would take over one hundred thousand of them to weigh as much as a chicken egg. You wouldn't notice them if you happened to be walking by. You'd scarcely notice them even if you were looking for them. 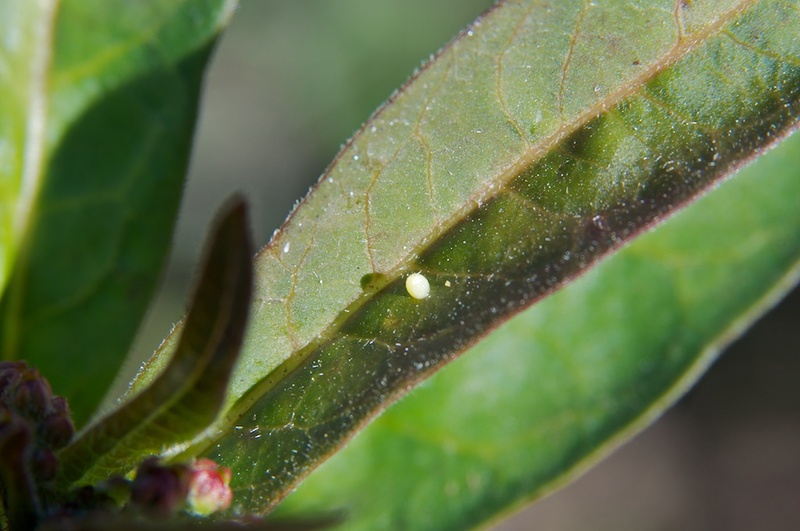 And yet these little specks on milkweed leaves are each the beginning of an extraordinary story that spans months and long journeys -- because these tiny dots are Monarch Butterfly eggs. These particular eggs, located in Archie's Garden (in Mar Vista, California), were laid on January 15th, 2011 (see the slideshow). If all goes well, they will hatch in four or five days, and striped caterpillars will emerge. Over the following two weeks, those caterpillars will grow, molt, grow some more, molt again, and so on. If they avoid being eaten by birds or being done in by predatory wasps, they will be ready for the next stage, and they will go through another transformation. They will pupate, and each occupy a shell-like container called a chrysalis. Another ten days will pass, and they will emerge -- butterflies! This complicated month-long process itself is only half of the story. As butterflies, they may stay in the area, or may go off on hundred-mile migrations. Come visit us here at Archie's Garden to watch the unfolding of this dramatic story, and learn more about Monarch Butterflies and other insects, organic gardening, plants, and more!